THERESIENSTADT WAS A NAZI GHETTO and labor camp near Prague from which tens of thousands of Jews were deported to their deaths during World War II. Decades after the war’s end, a long-hidden secret at Theresienstadt came to light: a tiny storeroom that, unbeknownst to the Gestapo, had been transformed into a synagogue. There, defying the Nazis' ban on religious worship, Jewish inmates would gather surreptitiously, a few at a time, to pour out their hearts in prayer -- an act as stirring for its courage as for its demonstration of faith. What was in their thoughts as they prayed we can only speculate. But they left some clues. On the walls of the clandestine chapel, elegantly painted in red and black, were Biblical verses and passages from the Hebrew prayer book. By now many of the words have faded away. But those that are still legible express poignantly the heartache and hope of the doomed Jews who addressed themselves to God in that small room as the Holocaust raged around them. "We implore You," said one passage taken from the daily liturgy, "turn back from Your anger and have mercy on the treasured nation that You have chosen." Pleaded another: "Despite all this, we have not forgotten Your name -- we beg You, do not forget us." There has been some controversy in recent days over comments about God and the Holocaust made by the Rev. John Hagee, the influential evangelical pastor of San Antonio's 19,000-member Cornerstone Church. In a sermon delivered a decade ago and recently unearthed by a hostile blogger, Hagee suggested that the Holocaust was part of a divine plan, and that Hitler was a "hunter" whose persecution of the Jews was not only willed by God but foretold by the prophet Jeremiah 2,500 years ago. "Why did it happen?" Hagee asked. "Because God said, 'My top priority for the Jewish people is to get them to come back to the land of Israel.' "
Hagee's interpretation of scripture was undeniably grotesque and jarring, to say nothing of presumptuous in its claim to know the mind of God. But his long-forgotten sermon became news for one reason only: He had endorsed John McCain for president, and the left saw a target of opportunity. Many denounced the pastor's remarks, some doubtless hoping that the storm would neutralize political damage caused to Barack Obama by the America-damning diatribes of his longtime mentor, the Rev. Jeremiah Wright. Others went even further, demonizing Hagee as an anti-Semite and smearing him, in the words of one Huffington Post contributor, as the kind of person who "celebrate[s] the Holocaust." For his part, McCain wasted no time cutting his ties to Hagee. He called the comments about Hitler "crazy and unacceptable," and repudiated the preacher's endorsement. As a Jew who believes in God and as the son of a Holocaust survivor, I find Hagee's theological explanation for the extermination of 6 million Jews strained and incoherent. Auschwitz and Babi Yar were not God's handiwork. They were the creations of men and women who were endowed with free will and who chose to commit evil. Hagee's theory that God willed the murder of Europe's Jews because they didn't embrace Zionism smacks of blaming the victims -- and worse, of letting their victimizers off the hook. And yet the belief that the Holocaust, like all calamities, is part of God's plan is hardly alien to Jewish or Christian thought. Those Jews in Theresienstadt, risking their lives to gather in prayer, surely believed the horror surrounding them must at some level be willed by God. That is why they begged Him: "Turn back from Your anger and have mercy." As anyone even fleetingly familiar with the Hebrew Bible knows, it is not "crazy," let alone anti-Semitic, to believe that Jewish suffering can be a punishment from God; that is an oft-repeated theme in Jewish tradition. What is, if not crazy, then at least reckless, is to claim to know God's reasons for permitting the Holocaust and other acts of of cruelty and murder. How a good and loving God can allow such evil is an old, old question, for which we have, in the words of Isaiah, only one real -- and far from satisfying -- answer: "For My thoughts are not your thoughts, neither are your ways My ways, says the Lord." John Hagee is no anti-Semite. Far from it: The founder of Christians United for Israel is a passionate enemy of anti-Semitism, who has built a great ministry upon the conviction that Jew-hatred is a sin that must be purged from Christendom. Even a good pastor can preach an occasional poor sermon, and Hagee’s remarks a decade ago would have been better left unsaid. But to tar him as an anti-Semite is the foulest kind of slander. 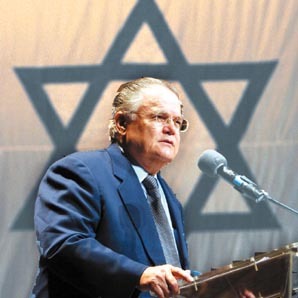 The Jewish people and the Jewish state have few friends in the Christian world as devoted and indefatigable as Hagee. That is as true today as it ever was -- even if it is politically unfashionable to say so.